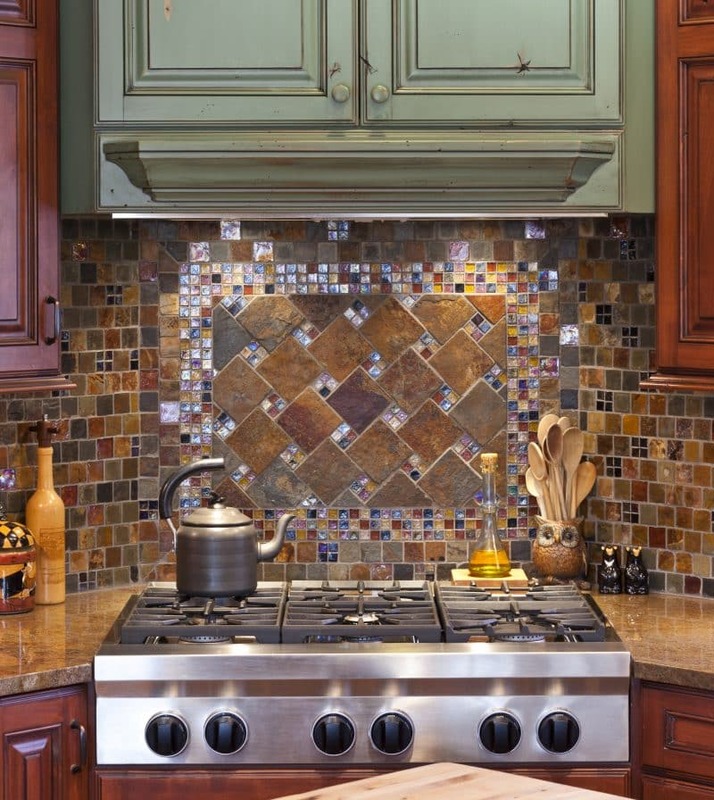 Bonjour and welcome to our Art of the Home gallery of 7 tile kitchen backsplash ideas! We handpicked them just for you…hope you enjoy the visit! Kitchen backsplashes are often considered a must-have in a kitchen. They add a stylish visual appeal, are relatively easy to install and work as a protective barrier from dirt and grime. Tile backsplashes are a good do-it-yourself (DIY) project or can be done on a lower budget than some other backsplash options (e.g. marble). Cleanup is typically easy, just a swipe using your favorite non-abrasive product and you’re done! Whether to complement your existing kitchen color palette or punch some vibrancy into your design, a tile backsplash is a beautiful practical answer. 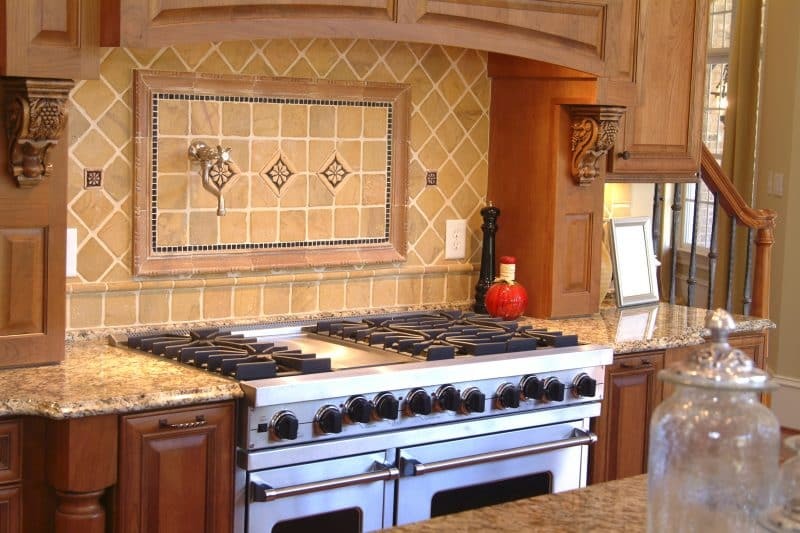 There are many tile kitchen backsplash ideas. Subway tiles for example are rectangular ceramic tiles that are quite popular. A backsplash or wall of subway tiles is a blank canvas for adding visual and textural interest. And if you like a pop of color, you could also consider incorporating a strip of glass mosaic tile. 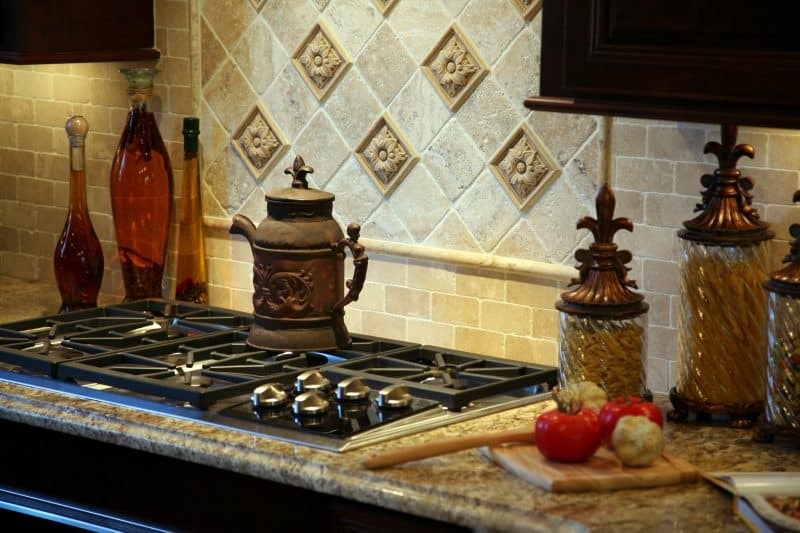 As for texture, backsplash tiles can be made of glass, ceramic or stone. And to add a unique touch to your kitchen, medallions are a great way to bring personality and character to your backsplash design. So let’s check out these beautiful tile kitchen backsplash ideas. We hope you will be inspired by our photo selection. Enjoy the visit and beautiful day to you! The Little Plus: the white subway ceramic tile — calm and soothing to look at. It sets the tone for this soft color palette of mints, pale blues and lavender. Ever useful and functional, the porcelain farmhouse sink paired with traditional style faucet create a nostalgic country feel. And aren’t those open shelves just charming with the distressed wood and all white tableware? The Little Plus: the unique backsplash is awash with texture. Made up of sleek glass and slate tiles, this design is blend of rustic and Mediterranean in a charming mix of old world stone hues and shiny touches of glass tiles. The checkerboard geometry adds visual interest too. 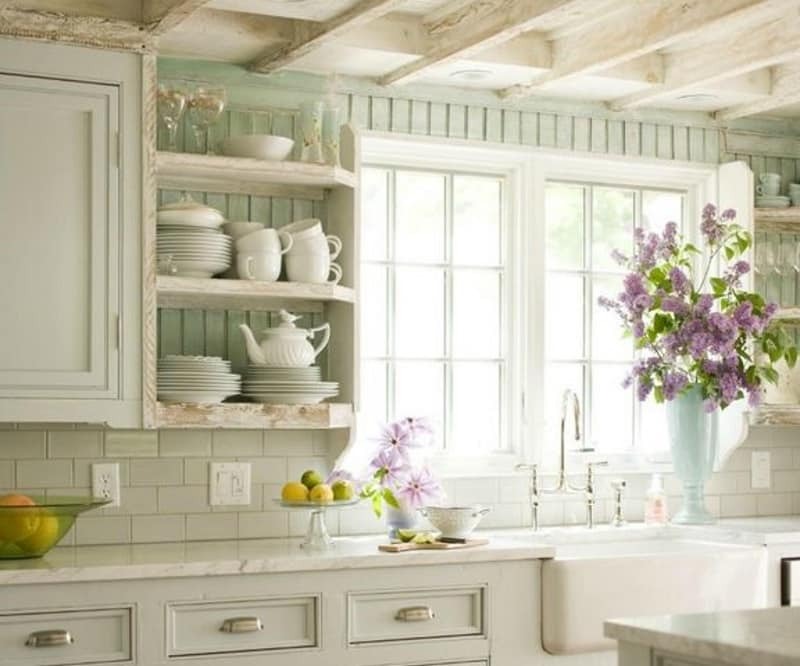 And notice how the distressed center cabinet with its weathered wood and seafoam green shade hides the range hood and offers convenient storage above the cooktop. The Little Plus: the La Cornue oven– the pièce de résistance in this kitchen. Not to overshadow this timeless piece, it is surrounded by a matching cream colored backsplash and the textured medallion. Also, notice how the wood range hood mantel classic motif adds a touch of old world flair. The Little Plus: the picture frame medallion. It showcases the three beautiful glazed flower tiles and is a great host to the wall mounted pot filler. 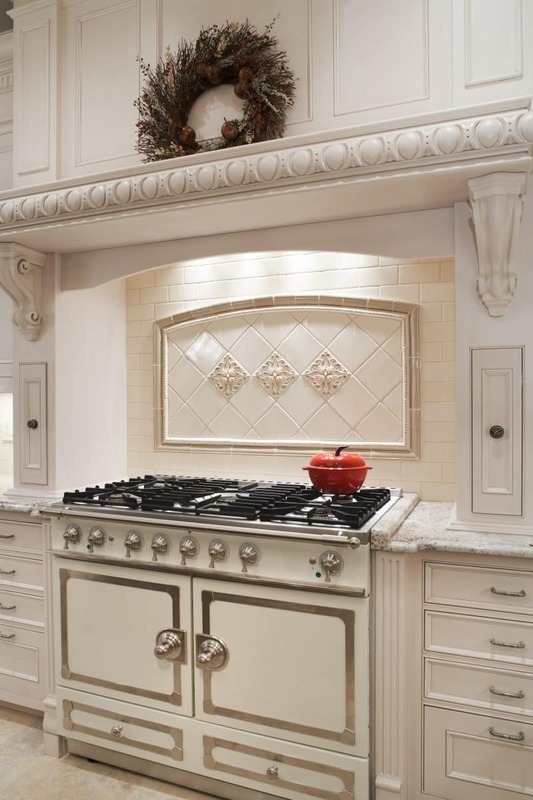 And to add more Tuscan flair to this kitchen, notice how the custom wood range hood is designed with wood corbels carved with floral and grape designs…simpatico!